I'm not sure what piece of data slipped into Amazon's algorithm to cause them to advertise the recently published YA novel Nice Try, Jane Sinner, but they did it, and I bought it. I'm a sucker for anything with the word "Sinner" in the title. A few years back, I used this highly sophisticated methodology to purchase We Sinners by Hanna Pylväinen and I was not disappointed. Jane Sinner is a 17 year old high school drop-out from Alberta, Canada. We learn that she dropped out of school shortly after the Christmas vacation on account of something that happened called "the Event." Whatever the Event was, it has created a crisis of identity in Jane's life. She no longer feels welcome at school—stared at and talked about by strangers, tip-toed around by friends. She has abandoned her childhood faith and her church youth group friends and is completely alone. Her parents, her pastors, and her closest friends are all pushing her to move forward with her life but she lacks motivation or interest. Her parents push her to enroll in a community college where she can finish the credits she needs to graduate high school. This leads Jane to discover that some community college students are producing a reality TV show that invites students to live in a community house and compete for a car. Lying to her parents, Jane strikes a deal with her parents that she will go to school if they let her live in a house with other students. Her parents eventually relent, and Jane begins her journey to public access reality fame. I think my favorite thing about this book is the way that it chronicles the fragility of adolescent faith and the family and church dynamics that are sometimes involved in youth group kids failing to transition to adult faith. We eventually learn that "the Event" is a botched suicide attempt. Jane loses her faith but has no one to talk with about it. She continues to go through the motions of church and youth group and be a "good girl" with her family, but she is plagued by an unchecked nihilism that eventually results in a poor decision to jump of a cliff at a New Years party. This feeling of loneliness is complicated by the fact that her parent's vision for the restoration of her health includes her return to church and her faith, something she simply cannot give them. Another surprising feature of the book is Jane's complex friendship with her best friend Bonnie. Bonnie is a bisexual teenage convert to Christianity. Her family is not Christian and yet, somehow, through her friendship with Jane, she becomes a Christian and a central character in the church Youth Group. Bonnie's faith is genuine and constantly in tension with the fact that many people in her church don't accept her bi-sexuality. Jane doesn't understand how or why Bonnie sticks it out, and yet, Jane is genuinely inspired by Bonnie's faith, and even embarrassed that she was one of the people who used to judge Bonnie's sexuality. The book doesn't resolve Jane's problems with faith (nor should it). Like so many teenagers before her, Jane finds herself in a wilderness between a childhood faith that begins to feel increasingly shallow and platitudinous and an adulthood that is far too complex and nuanced for her childhood faith to survive. Oelke is not so much attacking the church, as she is presenting the realities of North American Evangelical Christianity: the best representation of the faith in the novel is the convert Bonnie, not the cradle Christians or the culture Christians—a point hammered home when Bonnie goes off to college and is ostracized by her new church for her bi-sexuality. 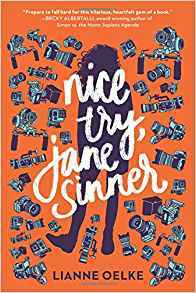 If nothing else, Jane Sinner is a helpful reminder that young adults think deeply about questions of faith and the authenticity of faith and they will not settle for the security blanket faith that their parents want to see as a barometer of their well-being. Review: Great beach reading/Most likely to become a CW series.